When Katie Van Gheem attended the Cornerstone Foundation’s TendHER Heart luncheon in 2011, the mother of two from Gilberts, Ill., got much more out of the event than just a nice meal. 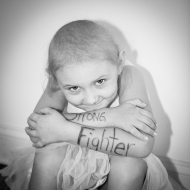 A year earlier, Katie’s four-year-old daughter, Ella, had been diagnosed with leukemia. Attending the luncheon, which is held annually to honor more than 150 moms of critically and chronically ill children for the sacrifices they make, gave Katie a rare chance to bond with other women who were enduring the same type of nightmare. “I can tell you that for the first time you really don’t feel alone because a big part of this journey at least for me when it first happened was that I was searching for other moms and other people that had been through something similar with a child and I struggled to find that,” Katie said. “You’re pretty segregated in the hospital, at least the way ours is set up, because you’re trying to keep the kids away from each other so they don’t get sick, and because of the patient privacy policies it’s not really an opportune time to bond with other parents. Katie delivered her speech alongside Bears All-Pro cornerback Charles Tillman, who created the Cornerstone Foundation in 2005 originally to provide children with educational opportunities and resources to excel in the classroom. After Tillman’s three-month-old daughter, Tiana, was diagnosed with a rare heart disorder and received a life-saving heart transplant in 2008, the mission of the foundation was changed to improving the lives of critically and chronically ill children. Nothing made a bigger difference to Katie and her family than the great news they received this past November; after 794 straight days of chemotherapy in and out of Ronald McDonald’s Children’s Hospital of Loyola University Medical Center in Maywood, Ella was declared cancer free. Katie prays that her daughter will remain healthy and will never forget the support and inspiration her family received from Tillman and his wife Jackie. Katie recalls when Tillman gave Ella a “Build-a-Bear” during a hospital Christmas party in 2011, not realizing that the little girl received a new Build-a-Bear every time she went underwent treatment.